When a closet is organized, everything is easier to find. That means you will always know the location of your favorite sweater, your prized pair of jeans, and your go-to work button-down. Gather your closet organization supplies, including a “toss” basket and a tape measure. Empty the closet of all contents-clothing, shoes, closet organizers, etc. Declutter your wardrobe and donate, recycle, or sell the clothing items, shoes, and accessories you no longer need. Assess your closet storage solutions to make sure they fit your closet space and work with your clothing, shoes, and accessories. Come up with a plan to keep your closet organized so it never becomes a breeding ground for clutter again. The first step to organizing your closet is to ensure you have the right tools and supplies on hand before you dive in. Resist the urge to start this project after a long day of work. In order to really organize your closet for the long haul, you’ve got to do a little prep work and find time in your calendar when you have 2 to 3 hours to commit to this process. Shopping Bags: Sturdy bags to transport clothes to the donation center, tailor and dry cleaner. If you don't have bags, boxes and bins will do in a pinch. Tape Measure: To measure shelving and hanging space. Don't forget a notebook and the writing utensil of your choice to jot down your closet's measurements. Full-Length Mirror: In order to decide between "toss" and "keep," make sure your mirror can accommodate your entire image. Catch-All Basket: Loose change, papers, rubber bands, hair clips, wads of cash (score!) and assorted receipts you'll find in pants pockets. You don't want to have to stop in the middle to file these small items so just put them aside for now into your catch-all basket. Additionally, have an idea of what you’re going to do with clothes to decide to get rid of ahead of time (here’s a helpful list of ways to get rid of clothing). You have three options: donate, consign, or trash. Try to donate and consign as much as possible, while trash is really only for the items that are beyond repair/use. If you’re used to shoving clothes into your closet, this is going to be weird, because you’re about to take everything out and probably find some stuff shoved in a back corner that you forgot about. Remove everything from the closet, including hangers, baskets, bins, and anything else that might be on the floor or shelves. 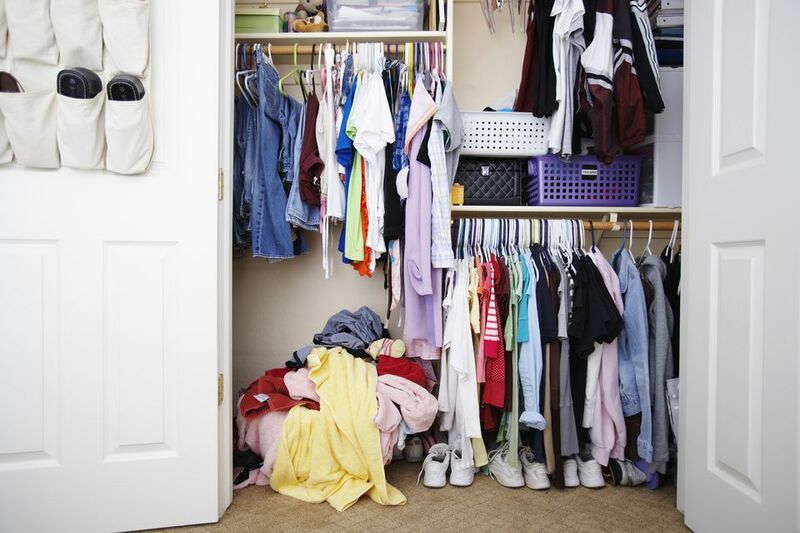 You need a clear, clean space to plan and visualize how you're going re-organize your closet. First, dust the shelving and hanging rods. Next, run the vacuum or sweep and mop the floor. Finally, wipe the shelving, hanging rods, walls, and baseboards down with a good all-purpose cleaner. Don’t forget any baskets or bins that could be collecting dirt and dust. Now comes the part you’ve either been looking forward to or dreading. Some people fear decluttering because they love to hold onto things they “may need one day” or “used to fit/be in style.” Focus on what to keep rather than what you’re getting rid of. If you need help, check out this list of signs it’s time to get rid of clothing. Keep: Anything you love and wear often. Consign: In order to sell or consign items, your clothing, shoes and accessories must be in good shape. Most consignment stores prefer them to be name brands. Donate: These items should be in good shape. Think “gently used” when adding to this pile. Trash: Clothing to trash would include anything stained beyond repair, ripped, hopelessly out of style or anything that you would be embarrassed to donate. Does it project the image you want to portray? If the answer is "yes" to all three, then you can confidently place that item into the Keeper pile. If you’re really having a hard time, then create a "maybe" pile. Put your maybe pile into a bin and revisit it 1, 3 or 6 months later. If you forgot about these items or never thought about wearing them, you can confidently donate or consign them. A step stool will make it easier for you to reach the top shelves of your closet. A double hang will make better use of horizontal storage space in the closet. An over-the-door shoe rack can turn your door into the perfect place to store either shoes, accessories, or both. You might be tempted to throw your hands up, pull out your credit card and buy an expensive closet system. Don't do this. Measure the space, asses what you already have, and then plan your closet accordingly. Buy only what you need to store your clothes, and re-purpose what you already own, if possible. Small bookcases, cubbies, and baskets are great for storing handbags, shoes, accessories, and gym clothes. Finally, don't forget to measure a space three times before buying a new storage item. Nothing is worse than carting something home and finding it's just a smidge too wide. This is where you put everything back together in a way that makes sense to you, utilizes all of your available space, and is attractive enough to motivate closet maintenance. Think about where it makes sense to store each category of clothing and then think about the easiest spots to reach in your closet. Group Like with Like: Gather belts, sweaters, long-sleeve shirts, work pants, dresses, button-down shirts, jeans, shorts—you get the idea—and decide the best place to store each item as a group (i.e. hang pants in closet, fold and stack sweaters in a bureau). Working in groups of items will help you figure out how much space you need and the best way to store each type of item. Properly Utilize Prime Real Estate: Reserve the front and middle of your closet for clothes you wear most often. If you have to get dressed for work each morning at 6 a.m., make sure your work clothes are at the front of your closet. Lesser-worn items like formal wear and out-of-season should be stored toward the back and on the upper shelves. Tuck Away Least-Used Items: Use the very top of your closet for out-of-season items and stuff you only wear a few times a year, such as Halloween costumes and super-fancy shoes. ​Accessories and shoes should be stored separately from your clothing (in other words, don't lump scarves in with sweaters), but keep the prime real estate rule in mind. If you wear a pair of shoes all the time, don't store them in the back of your closet. The more often you work on closet maintenance, the less time it will take. Go through your closet and complete a quick makeover (or make-under) once a month, and tackle the full re-organization process twice a year. Make it easy on yourself by following a cleaning schedule, either by season, by date (such as your birthday or New Year's) or by event. In other words, the next time you can't find an important piece of clothing, that's a good sign you need to re-org your closet.